Filming for Season 2 started about six weeks ago. The Season 2 Premiere will be in six weeks. I guess that means Halftime! Also, puppies have been taking over the set! Filming for Season 2 started about six weeks ago. During the last few days, the rate of pictures and videos being uploaded has flared up again. It’s so much I can’t even put it all into this Update, but it looks like we’ll get a car accident, explosions, a Halloween Episode, a plane crash and Mac crawling through tunnels! I had hoped for a bigger budget for this season and I think CBS believed in the success of the Reboot; giving them the means to step up the quality of the production. Cast and Crew are filming in many different locations. Because we still don’t know much about the storylines yet, it’s sometimes difficult to attribute the pictures to the right episode. According to the Casting Calls, we will join “Team Phoenix” to Paris and other interesting locations. Executive Producer Peter Lenkov posted a very interesting picture on August 9. It’s a shot of Episode 2×04 (X-Ray + Penny) and shows “Young Mac and grandfather”, the grandfather fiddling with an SAK. Funny thing: We can’t see the grandfather’s face. This led to speculations if we would ever get to see his face in the episode or not. If it’s told from Young MacGyver’s point of view, I think it’s actually possible we won’t; at least not for now. It’s interesting to note that the actor does remind people of Original MacGyver Richard Dean Anderson. Lenkov had hinted that he wanted RDA to play the grandfather – but we already know that RDA had declined when they approached him over a year ago. I’m curious if Lenkov left a “backdoor” open by witholding the viewers from seeing the grandfather’s face – just in case RDA reconsiders his opinion one day. On a recent event appearance (London Comic Con, I think), RDA said that he had an acting project in the pipeline, but that it was too early to talk about it. People have been speculating for a while now if he will come back as Jeff Webber on General Hospital or as MacGyver’s father or grandfather in the Reboot. We’ll see. I’m down with anything that RDA appears in because I think he’s not really done with acting yet. Otherwise, Peter Lenkov has been oddly quiet. He posted a few videos of him editing Hawaii Five-0 and a picture of Meredith Eaton as Matty. 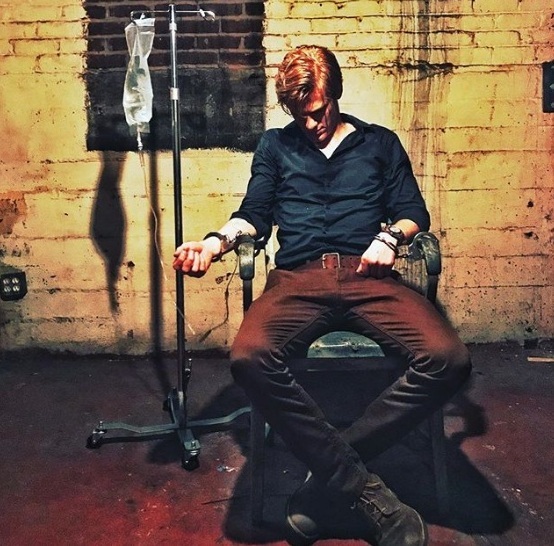 On August 8, Lucas Till uploaded a picture of MacGyver that FanFiction Writers would probably label as “Mac!Whump”. FunFact: Whump is a term to describe “physical and/or mental abuse laid on a character in a story” and is often used by Stargate FanFiction authors. I have a question that’s been bugging me for a while. How did you get that scar across your eyebrow? It’s part of what we established in the character. […] It was one of those elements of movies and television that has always driven me crazy. Like MacGyver, for instance, if we showed him naked at any point, he would be nothing but one big scar, because he was always getting cut or ripped or shot or whatever, beat up, bruised, and yet by the end of the series, he didn’t have a mark on him. It was one of those things. So, I can’t remember the episode, but I got hit in the eye or slugged or something, and we established a big bandage and the whole thing, and I told Jan [Newman, make-up artist], you know, this would leave a mark. Let’s run with this. Let’s keep it in there as part of what defines O’Neill. Lucas’ picture hints at Mac!Whump, but bears a strikingly similarity to the Opening Gambit of Episode 1×12 (Screwdriver) where Jack was the one getting whumped; being interrogated by a terrorist while under the influence of a truth serum. 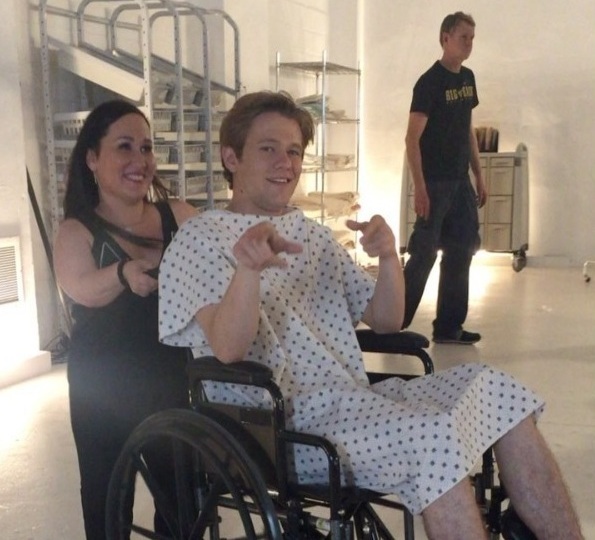 On Lucas’ birthday (August 10), Meredith Eaton posted posted a short video of Matty pushing the wheelchair MacGyver is sitting in. This fits the hospital scene picture that Lenkov had posted on July 31st. George Eads took advantage of the wheelchair during filming breaks as well (seen in an Instagram Live Story video by Justin Hires). 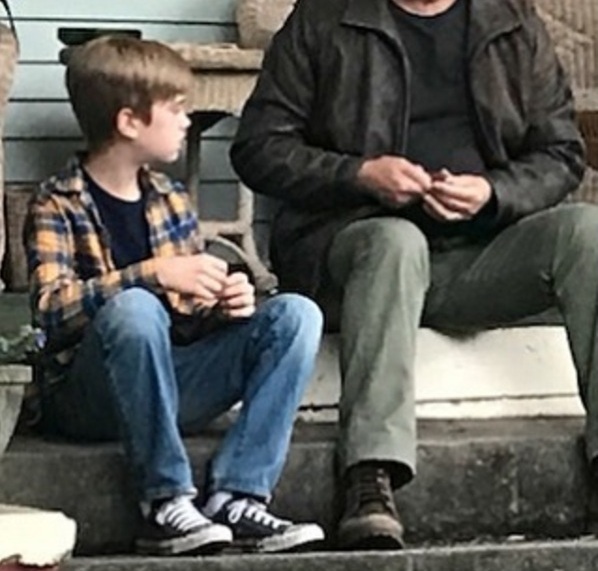 There was a sighting of George Eads on set this weekend. They filmed a scene involving an overturned military vehicle and a “big boom”. It’s safe to say that Jack will get whumped in this episode. Key Grip Steven Serna and his grip co-workers (e.g. Cam Everson) posted several pictures and Instagram Live Stories of the filming process. 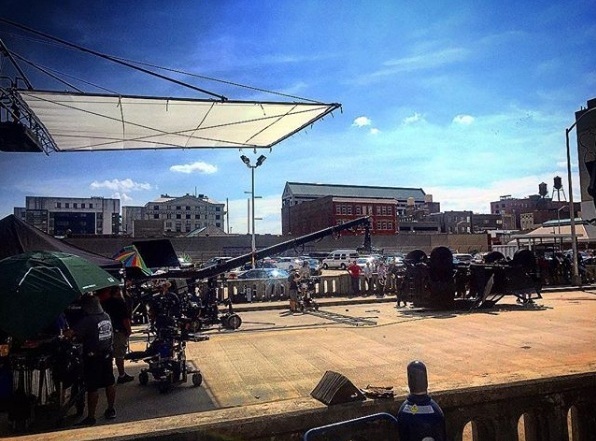 At one point, the filming had to take a break due to a demonstration regarding recent events in Charlottesville. A few days later, they filmed additional scenes in the studio. 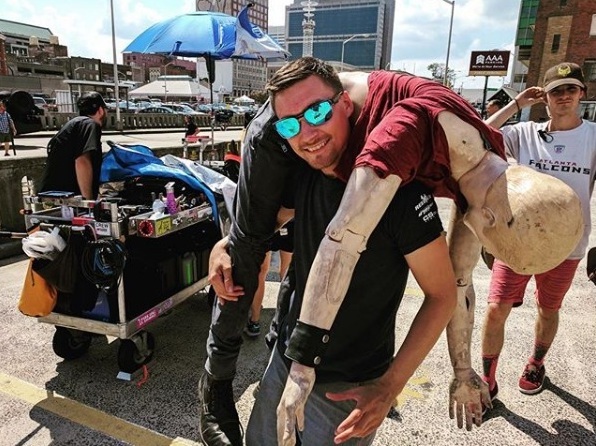 The crew had quite some fun with the Jack Dummy. They also had a dummy that could be the one for Lucas, so maybe both heroes will get whumped. I don’t think this action sequence is related to the hospital scene, though. Lucas Till shared on August 17 how he deals with the heat in Atlanta. It sure helped that Henry Winkler had sponsored an Ice Cream Truck for Cast and Crew. How cool is that? It might be Summer in Atlanta, but as Justin Hires revealed, they just started filming the Halloween Episode. According to Justin Hires and other BtS pictures by Anne-Marie, Cast and Crew are filming in the “Jungle” today. It’s possible this location is related to the plane crash. 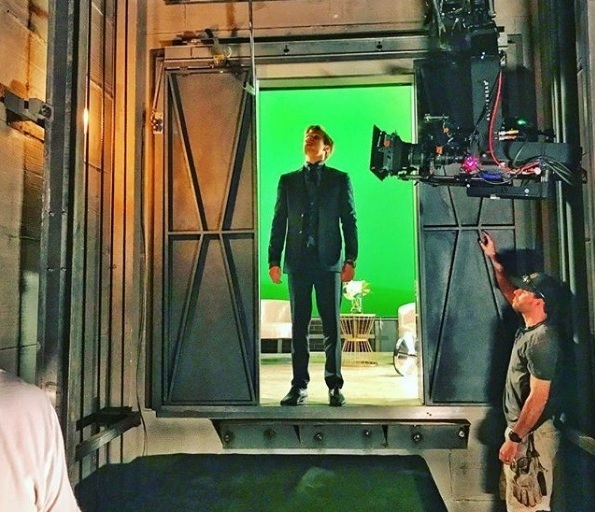 On August 10, Lucas Till posted a BtS picture of MacGyver standing in front of an elevator shaft. Considering he’s wearing a suit, it’s probably related to the Casino Episode (2×02: Roulette Wheel). 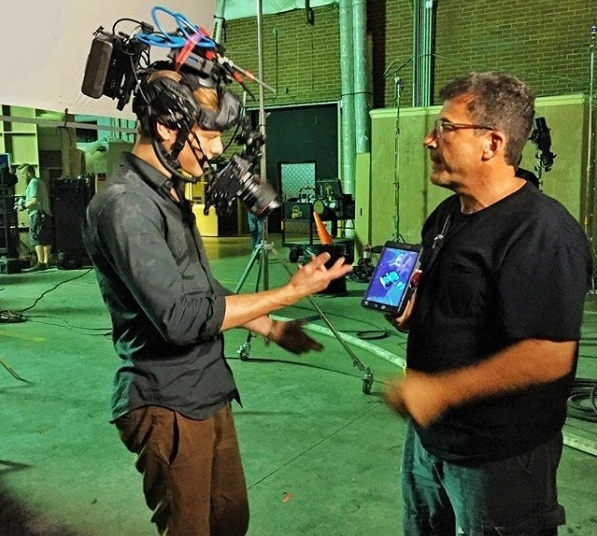 Lucas shared another picture on August 15 that shows him wearing an insane head piece: He’s wearing a camera to film scenes from MacGyver’s point of view. On August 11, Justin Hires shared a BtS picture of Bozer, warning all criminals not to underestimate “Team Phoenix”. He posted another BtS picture of Bozer wearing the same shirt, standing in front of Jack’s car. Jack’s car will get whumped, too. There were BtS pictures on August that revealed the car will be involved in an accident in an upcoming episode. Jack will be devastated. There might be a little whump for Riley as well: Brittney Joy caught the crew filming in front of her appartement in Downtown Atlanta on August 5. She posted several videos of the process; filmed directly from above through the window. At one point, it looks likey Tristin Mays’ character Riley gets stuffed into the trunk of a car. Besides Production Office Dog Clover (6 months) and Wardrobe Protection Dog Maggie, there’s Einstein. 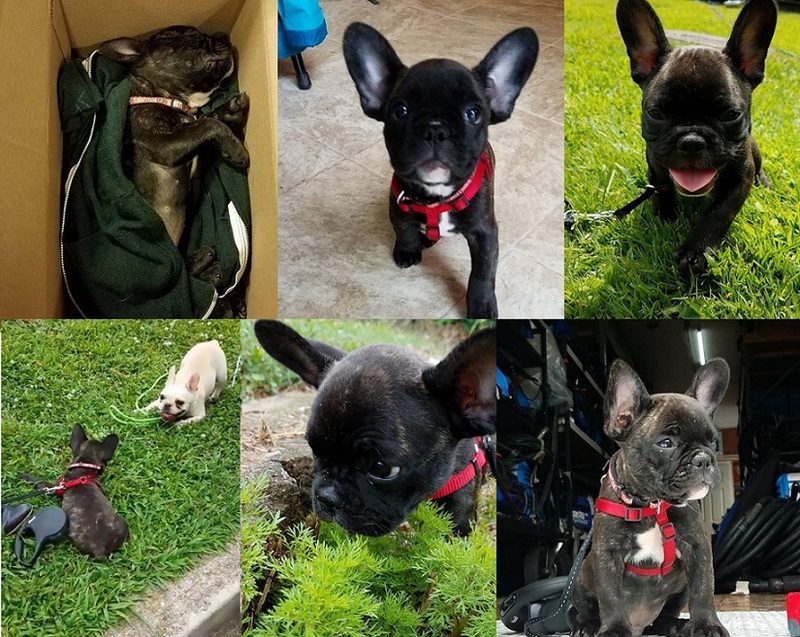 He’s everybody’s darling and has his own Instagram page with over 100 followers after just a week. Also, he’s Clover’s Cousin! I wouldn’t mind if they involved one of the dogs in the production. The Original show had many storylines involving animals, and so far we haven’t seen any of that besides in the Crossover Episode (where Bozer rescues the little dog). As with Season 1, the Extras have apparently been advised to keep quiet for now. There were only a few posts that revealed people being part of an episode; e.g. Carl Kenndy, Tev Lanier, Tyrus Smash, Danny Boushebel (Episode 2×01) or Meagan. About six weeks ago, we got some exclusive spoilers by Moviehole about the storyline of Episode 2×01 (DIY or DIE) and about the two new recurring female characters. There are still no official cast announcements or press releases yet. Since Isabel Lucas still seems to be filming with the main cast while Karolina Wydra isn’t on set anymore, I’m assuming that Karolina will play Olivia Cage while Isabel plays intel extraction specialist Agent Carmen. We got another glimpse of Carmen by a picture via George Eads. Isabel Lucas herself posted an Instagram Live Story picture that has her dressed with a gun holder like Jack. There is a chance that Karolina’s character Cage will be a recurring villain. Also, it’s interesting to note that she had apparently dyed her hair blonde just before filming started. She dyed it back to brunette this week. Central Casting Georgia has been looking for many Extras, e.g. for Stand-Ins, Techs and Agents, Doctors and Nurses, Photo Doubles for featured roles, Men and Women (to portray Europeans) with their own bikes, for small European type cars, LA Café Patrons, Middle Eastern Soldiers, for kids ages 10-11 for a fun Halloween Scene and for Men with Military or Tactical Experience. There was also a Casting Call named “Paris”, looking for European Patrons and cars. Another interesting Casting Call was made on August 6, when Central Casting Georgia was looking for five Stand-Ins. They provided pictures what the Stand-Ins should look like. One of these was for Kate Bond (who played Phoenix Tech Lil Morgan in Episodes 1×20 and 1×21), one for a boy and another one for a certain person we all should recognize. This is pretty exciting, I’ll say. 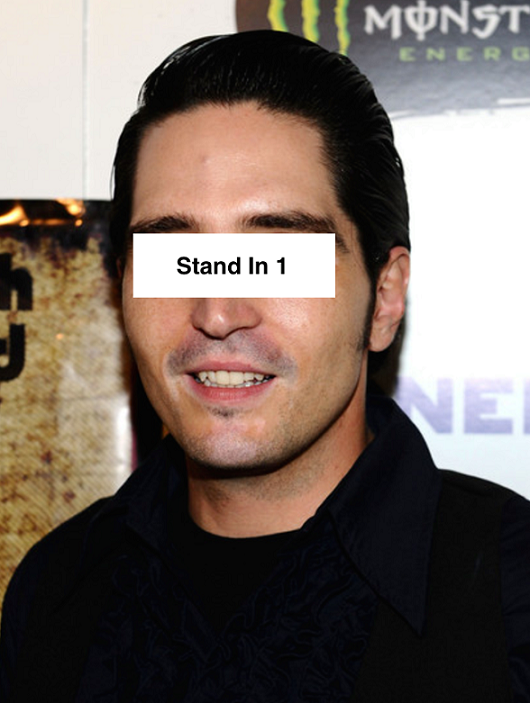 David Dastmalchian being in Atlanta last week wasn’t a secret, but I assumed he wouldn’t have time for doing anything else than filming for the new Antman movie. There is no rerun today. On September 1st, you can catch a rerun of Episode 1×20 (Hole Puncher). The rerun of Episode 1×10 (Pliers) on August 11 managed to get 3.75 million live viewers (with 0.5 in the important demo group of 19-49 year-old viewers) and won the 8pm time-slot again. Two episodes of the Reboot aired in Germany on Mondays, 8.15 pm and 9.15 pm on channel Sat.1. Despite predictions on social media and the constant negative reviews, the show earned good ratings. The two episodes this week (that also marked the Season Finale) earned the lowest ratings so far, though. On August 14, Episode 20 had 620’000 live viewers with a market share of 7.6% in its demo group (which is a market share of 5.3% in total viewers, meaning 1.42 million). The Season Finale (1×21) only earned 700’000 live viewers (with a market share of 5.6% in demo). On one hand, there was a soccer game going on at the same time. On the other hand, Sat.1 neglected their promo duties, constantly promoting “Promi Big Brother” (the equivalent of Celebrity Big Brother). The only tweet and post about the final episodes was made just 30 minutes before the episode aired. It’s a bit sad that Germany skipped 3 Episodes in total (Episodes 11, 16 and 19). Sat.1 claims “program-planning reasons” due to the premiere dates for new episodes of NCIS and Bull. They promise to air the remaining episodes next year with Season 2, but the consequence of witholding these episodes means that they’re also not available on streaming platforms yet. It’s also not clear to me what this might mean for the DVD release.